Walter Foster Jr, 9781633223813, 96pp. Where can I go camping? What gear should I take with me? What fun stuff is there to do? 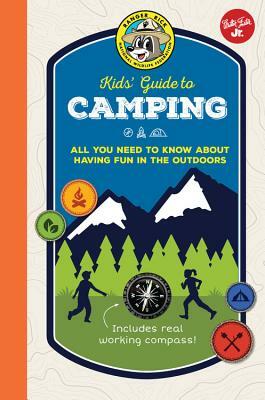 Ranger Rick Kids' Guide to Camping has the answers for you! Plus, this book has a real working compass inside to help you navigate through the wilderness. If you’re like most kids who love the outdoors, you want to do more than go on picnics or hike a nature trail. You don’t want to go home at the end of the day. You want to stay out in the woods, mountains, or desert. What you want to do is camp! With Ranger Rick Kids' Guide to Camping, you'll learn how to make roughing it easy. Inside are great tips for choosing the best campsite and setting up your home away from home. Once you’re done reading this book, you’ll know why you may want to get a self-supporting 4-season tent or a “mummy” sleeping bag with a specific comfort rating. You’ll know how to pitch your tent, build a fire, make a meal, and entertain yourself after it gets dark. And maybe most importantly, you’ll know exactly what to do when “nature calls” and there are no bathrooms around! The more you learn about camping, the more fun you’ll have on your next camping adventure. So read the book, and then head for the great outdoors and use the compass to help you find your way. Happy camping! Cherie Winner taught college zoology before starting her career as a writer. She enjoys camping and hiking with friends and with her dog, Sheba. Her previous children's books include Penguins, Bison, and Lions in the Our Wild World Series.